Jog dial, has a large display and quiet drawer mechanism. Top of the line Integra for ‘98. Very natural sound. Sometimes it drops out in the middle of a cd, on every cd. I figure it started doing this after twenty good years, which isn’t bad for any brand! I love this CD player a lot -NOT BECAUSE I got it for 70 bucks, but for it''s great performance. I''ve had experiences with YAMAHA, DENON, and the regular ONKYO line. TO me, I personally love this ONKYO INTEGRA CD player most, along with the DENON (awesome by the way). Repeat, program, and some functions only on remote (which I did not get). I purchased this CD player used for $70 at a local swap meet. I know Onkyo too well, and this CD player was Onkyo INTEGRA (best of what they have to offer). The dude didn''t know what he was selling, so I checked all functions to make sure it WORKED properly -and they all did to my amazement! Got it home. Plugged it into my Sony ES receiver and boy, the sound just blew me away! (honestly). The Guitars- you could here very well seperated. Vocals- life-like and vivid versus the Sony. Instruments come alive and BACKGROUND detail sound you finally here. Yamaha, ONkyo, Denon, Sony Changers. Upon purchasing a new integrated amplifier (see my review of the Jolida SJ 202A), it became readily apparent that my Luxman CD player had some serious flaws that I was unaware of previously. Now don't get wrong. The Luxman player had been a loyal and faithful servant since 1985 when I purchased it. But CD playback has come a long way since those early days of digital technology. Listening to the newest wave of CD transports and D to A converters made this clearly evident. It was time for a change. In order to gain spousal approval for this new purchase, one caveat was made: it had to be a multi-disk player. This quickly narrowed the field of contenders to a handful of products that are made by companies that are more interested in sound than bells and whistles. So off I went to the local "hi-fi" shops to do some listening. I won't go into much detail about this experience except to say that most of the products left a me a bit underwhelmed. After looking at three stores, I was most impressed with the NAD player. Then I went by the store where I had recently purchased my integrated amp to listen to the Parasound and Cal Audio players. When I explained my quest to the always helpful sales guy, he quickly responded, "Hey, we just got a new Onkyo player in a couple of days ago." "It's still in the box." "Do you want to take a listen to it?". Uh, sure, why not? Needless to say I was a bit skeptical. I mean Onkyo isn't exactly a "high-end" name is it? While we were unpacking the new baby he explained to me that Onkyo is a pretty well respected name in the business and they actually manufacture some products for some another high-profile name in the audio industry. We then set the Onkyo DX-C730 player on top of the Parasound player for a friendly head-to-head comparison. He then left me to my own devices with a handful of CDs and three remotes. I listened to both players extensively, listening to a wide variety of music. It quickly became apparent that the Onkyo player excelled the Parasound in all phases of music reproduction; this right out of the box with no burn in! Sibilance is one my pet peeves with digital. The Onkyo was clearly better in this regard, with only the slightest hint of snakiness. The Onkyo also excelled in dynamics and truth of timbre, especially in the higher frequencies. The almost mechanistic sound that I had heard in many of the players I auditioned was totally absent with this player. Now that the Onkyo had thoroughly thrashed the Parasound, I ready to compare it to the Cal Audio CD-5. So once again we set up for a head-to-head match. Guess what? The Onkyo lost. But not by the margin one would expect. The two matched up very well when it came to realism and naturalness of sound. Where the Cal player really excelled was micro-dynamics and heightened sense of ambiance. It seems that the CD-5 is able to milk a bit more information out of those shiny silver discs. Of course, the Cal player costs twice as much as the Onkyo and any people believe that Cal Audio produces the best multi-disc players on the planet. After listening to both players in couple of other listening sessions over a couple of weeks, I determined that, for the price, the Onkyo couldn't be beat. Just for kicks, the fellows at the shop even did some A/B comparisons with the Onkyo by itself and its output through a couple of separate DA converters. The Onkyo still sounded better with its own circuitry than the Cal Alpha DAC and the Audio Alchemy (R.I.P.) DAC-in-the-Box. I was convinced and bought the thing as fast as I could. The Onkyo DX-C730 is part of Onkyo's Integra line. This is their premier line of components. It is carousel type changer that holds six discs at one time. As far as I know, Onkyo is the only company who makes carousel players that hold six discs. The fit and finish are excellent. I was surprised to discover how heavy this player is when I installed it in my own system. It may have the smoothest tray mechanism I have ever seen. It just glides on out as if it were riding on air. There is absolutely no motor sound coming out of the thing while it playing. Little things like that are indicative of this player's build quality. If you are in the market for multi-disc player, I would definitely recommend you give the Onkyo DX-C730 a tryout. While the Onkyo name may not be found on someone's recommended component list, don't let that fool you. Trust your ears; you won't be sorry. Detailed and produce clear sound. Runs very, very quite!, holds 6 cds. Hello. I been using this CD player for a months now. I got this CD player at circuitcity for 200 dollars. It was display model that is how i got it cheap. Well my old sony CD player was kept skipping, so I was looking for a new CD player. Two months ago, I went to Circuitcity to check out some CD players and I found this CD player but it was display model. I listened to some of the music that I own through different speaker. The sound was really nice. Very detailed and clear! I got the CD player and removed my old CD player and hook up the Onkyo DX-C730 CD player! I really was very superised because of the sound difference! I played Creed, and Starwars soundtrack. Heck i even tried my Back To The Future soundtrack. It was clear and detailed and mostly it produced more bass than the old sony player i have! Well I own a YAMAHA HTR-5150 a/v receiver and I got a pair of Sony MF ss-515 and a pair of Acoustic research PS-318 and a Acoustic research 225ps center. (please check all this equipment review at this site) I get more than enough bass on Creed and clarity of the Sarwars soundtrack is not even funny! It's awesome! Well I really do not know why people reviewed this CD player so poorly. I guess the price people paid for! I cannot complain anything since i got this unit for 200 dollars! Well it is well made CD player. 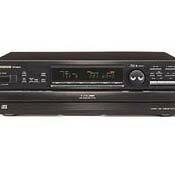 Get this CD player if it around 150 to 200 dollars! Thanks! I thought lightening does not strike twice but in the case of ONKYO IT DID! I had previously owned a lower numbered ONKYO 6 CD Carousel Changer and after a few years the drawer mechanism failed and it would open and then close immediately. This would happen almost constantly and it took much time and patience for me to keep pressing the open/close button until the drawer finally remained open. So I finally gave up on it and purchased the higher numbered top-of-the-line DXC-730. The thought that the same thing would happen again was furthest from my mind. Well damn, the same thing has happened and after only 18 months of use. So despite the decent sound and ease of operation and features, I cannot recommend this or any ONKYO product. After over a year of use, I am generally happy with this top of the line CD changer. The sound seems to be better after it has been on a while so I make it a point to keep the power on whenever I am home and there is no lightning storm which could cause a power surge. Besides the fact that there is no power button on the remote, my only other complaint is that once in a while the drawer will not stay open when I press the open/close button. This is an intermittent quirk so far, but I hope it does not develop into a real problem like one of the previous reviewers experienced. Also I cannot understand why ONKYO designed the unit to rotate completely every time I close the drawer. This would make sense if the PLAY button is pressed but why if open/close is pressed? I purchased this Onkyo at the local Circuit City and it works well for my needs. It has an optical output (which used to be a rarity) and I have it hooked into my Onkyo TXDS656 receiver. Overall the sound quality is excellent. The only complaint I have is with the remote. It isn't the easiest thing to read and I believe Onkyo is correcting this on future models soon. Overall, if you can get a good deal on this one, pick one up. so far i haven't had any problems with mine at all. it works flawlessly. this cd player sounds excellent period. the drawer mechanism is as smooth as glass and the player is super quiet. my only complaints are that not all functions are shared between the front panel and remote and there is no headphone jack. I purchased the DX-C730 to go with my Onkyo Integra system, because it had compu-link (only one remote is needed), and because I've had good luck with Onkyo. My (integrated) amplifier is the Onkyo A-9711; I listened to Adcom, Carver and NAD gear in the $500-1000 price range before deciding the Onkyo sounded best to me. The player replaced a lower-end Denon that was sticking on tracks and losing the remote function; it is very solid, quiet and dependable. I have noticed, however, a loss of presence in the treble (Sarah Chang, The Lark Ascending) and some loss of sound stage when compared to the Denon. This is disappointing; I tried tweaking with Vibrapods, but not much gain; I might try an MSB Link DAC, since the Onkyo has a digital output. All in all, if you have to spend more than $400 for the Onkyo, it might be wise to check some other machines. The quality of build is very good, but I think they slipped on getting the best sound from this one. 5 stars for dependability, 3 stars for sound = 4 stars. My overall experience with this player, unlike many others who have posted here, has been positive. The sound quality that this player produces is somewhere between equivalent and substantially better than the sound generated by most of the three or so other players that I auditioned in the $300 to $600 range (I can't recall specific models. Sorry folks!). Right out of the box, the player did sound a little flat to me. Over about a month or so of use, the music generated by the player gradually became more dynamic and vivid. I can't tell if it was a burn in period for the player or a break in period for my speakers or a combination of both 'cuz I picked up new speakers with the new player. Sounds like there are some real quality control problems with the production of this unit, but luckily I haven't come accross any yet. If you get lucky and can get a properly assembled unit for less than $350, it is certainly a purchase you should consider. If you are considering paying full retail of $550.... Maybe not.